Recenlty, the 'Udta Punjab' actress Kareena Kapoor spent some time posing for a selfie with her co-actor from the movie Diljit Dosanjh. Diljit is seen in a white shirt and red turban, and the gorgeous actress looks simple yet stunning in off white in the selfie posted by the Punjabi actor. The latest trend in town is clicking selfies. With most actors going click click themselves, we get to see latest pictures shared by the them. 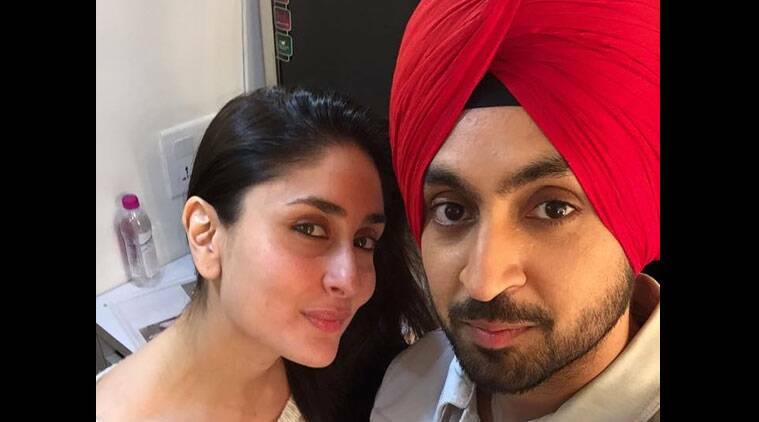 Recenlty, the ‘Udta Punjab‘ actress Kareena Kapoor spent some time posing for a selfie with her co-actor from the movie Diljit Dosanjh. Punjabi actor and singer Diljit, known for his hilarious antics on screen and the foot tapping songs seem to be giving a good company to Kareena. Diljit is seen in a white shirt and red turban, and the gorgeous actress looks simple yet stunning in off white. Recently, the duo was also seen shooting for the movie in Punjab, when Kareena was seen sitting behind Diljit on a bike.